Living, Learning, Working, Teaching, etc. Above photo: landcare is science (observation, learning, knowledge, etc) and art (creating, growing, planting, weeding, digging, building, etc.). Students looking at a goldenrod seedhead. 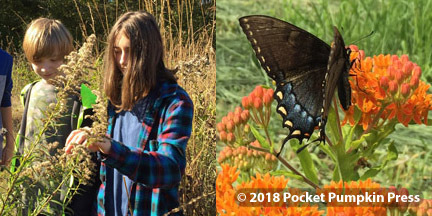 A black swallowtail butterfly on a butterfly milkweed, in a restored prairie. Community, Nature, Culture, Landcare, Science, Art, all of these activities help to sustain and enrich communities, people, and nature. Landcare (taking care of nature) is part of holistic healthcare for both people and nature. What people do to nature, they do to themselves. As people keep the water clean, people get to drink clean water. Both people and nature are cared for. In holistic health care, people need nature for many things: air, water, fertile soil, wood, beauty, inspiration, relaxation, excitement, etc. When you help nature, that helps people. When you guide people to help nature, that helps people too. When education teaches students the community arts and how to take care of nature, that helps both people and nature to be healthy. ★ at Pond G, I do holistic landcare, of living, learning, teaching, working, at moral health, nature science, nature art, permaculture food, landcare, and community culture. See Pond G.
⛛ at Homeschool, I teach academics, nature science, the community arts, and landcare. See Homeschool page. ▲ in Teaching, classes for the Galien Valley Nature and Culture Program (GV-NCP), I teach nature science, the community arts, and landcare. My classes are: Community and Landscape: Environmental Workshop (CLEW), Habitats and Wildlife (HW), Nature and the Community Arts (NCA), Nature Heritage (NH), and Wilderness and Culture (WC). See Teaching page. ✿ for Pizzo, I do landcare. Pizzo and Associates is an ecological restoration firm, with offices in Leland, Illinois, and Three Oaks, Michigan. See Pizzo page. May 2018, June 2018, July 2018, and Holistic Days. Also, see my Daily Blog, which includes landcare. Also, see my Holistic Days, which include landcare, particularly holistic landcare. Also, see how landcare relates to education and the economy in: The Changes Needed in Education and the Economy: 7 Goals and Success Indicators of culture, education, ecology, and economy. Also, see 40 ways to sustain communities, people, and nature.